Does A Higher Minimum Wage Kill Jobs? Labor advocates say raising the minimum wage stimulates consumer spending. Problem is, with the unemployment rate still at 8.8 percent, elected officials don't want to do anything that might discourage job creation. Does A Higher Minimum Wage Kill Jobs? 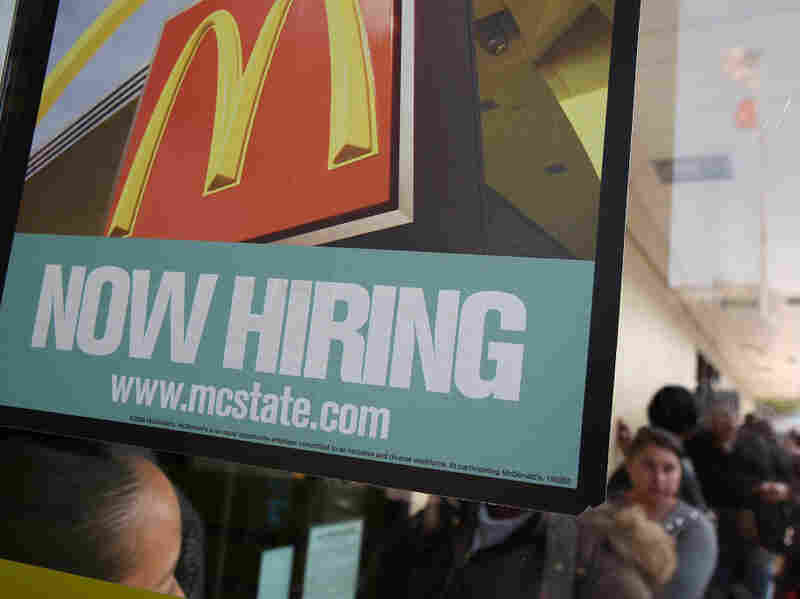 Job seekers lined up at McDonald's restaurants nationwide last week, hoping to fill one of the fast-food chain's 50,000 openings during a one-day nationwide hiring event. As the days grow warmer, employers who run roller coasters, water parks and hot dog stands are preparing for the summer season. They're seeking workers to fill jobs at or just above the federal minimum wage of $7.25 an hour. Labor advocates say it's time for those workers to get a raise. They noted that when the minimum wage was last increased in July 2009, the cost of gasoline was about $2.50 a gallon. This summer, the pump price may well be twice that in many locations. Workers will also be spending more for their lunches because of higher food prices. But the political outlook for a cost-of-living raise is bleak this year. With Republicans in control of the U.S. House, labor advocates are not expecting Congress to act. Instead, they have been focusing their lobbying efforts on state legislatures. Seventeen states and the District of Columbia have minimum wages set higher than the federal level. For example, in Oregon the wage is now $8.50 an hour. Minimum wage supporters are hoping to prompt at least a few states to act. In Illinois, for example, some lawmakers have been pushing to raise the state minimum wage up to $10.65 in steps over four years. So far, they have not been successful. In fact, no state has voted to increase the minimum wage this year. The problem is that with the unemployment rate still at 8.8 percent, elected officials don't want to do anything that might discourage job creation, especially for low-wage workers. Business groups say a wage increase at this time would be a blow to workers because it would only discourage job creation. Government-mandated wage hikes "cause restaurant operators to make very difficult decisions to eliminate jobs, cut staff hours or increase prices," according to the National Restaurant Association, a trade group. The federal minimum wage was last raised in 2009, to $7.25 an hour. In 1971, the minimum wage was $1.60. Adjusted for inflation, a worker today would have to make $8.83 an hour to have the same buying power, according to the Labor Department. Labor advocates insist that thinking is wrong-headed. They argue that unless more workers get pay raises this year, a lot of families won't have money to spend. And, they say, that's exactly what the U.S. economy needs — more consumer confidence and more spending. To stimulate the economy, lawmakers should insist that employers put more money into workers' wallets, the argument goes. Political polls consistently show broad support for that viewpoint. "The average person knows the cost of things is going up," says Jen Kern, minimum wage campaign coordinator for the National Employment Law Project. "This is a critical part of recovery — to help people have more money to spend." Economists have been debating which of those competing views is correct ever since the federal minimum wage was first enacted in 1938. Some studies show raising the wage reduces the number of jobs, while others show that a modestly higher wage can stimulate spending without costing jobs. In any case, while the debate continues in the United States, officials in other countries, especially in Asia, have come to a conclusion: Low-wage jobs need to pay more to head off social unrest. Workers are becoming angrier about this year's rising food and fuel prices. In China, Indonesia, Mongolia, Malaysia, Vietnam and Cambodia, the governments are in the process of introducing or toughening their minimum wage laws. In Hong Kong, for example, the government is imposing a minimum wage for the first time on May 1 — just in time for International Workers' Day.